In 2009 Copenhagen hosted one of the most important events in the battle against climate change. The Climate Conference was designed so then all the nations of the world could voice their opinion on what was happening, and come to some form of arrangement on how to deal with it. For President Mohamed Nasheed of The Maldives, it was more than just a negotiation. He was trying to save his country. If current climate trends continues, The Maldives will disappear under the Indian Ocean, an event with startlingly could happen in our lifetime. At the moment, The Maldives is only one metre above sea level, and the sea levels are continuing to rise. 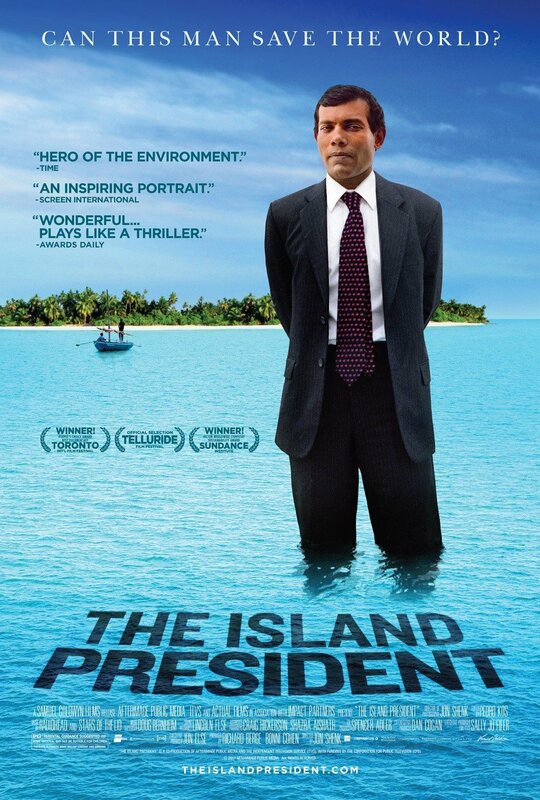 The Island President documents Mohamed Nasheed’s first year in office, attempting to show to the big political powers in the world just what is happening to his country. This is not your typical environmental documentary. First of all, it’s not presented a bleak vision of a future apocalypse. In fact it’s surprisingly optimistic. The beaming smile and general charisma of President Nasheed no doubt is the cause of this. He most certainly is a showman, hosting an underwater cabinet meeting is a prime example of that. 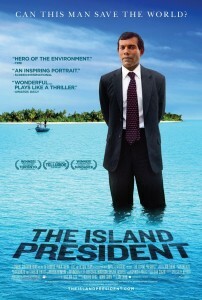 Nasheed is more like a hero from an upbeat drama, about a young underdog attempting to take on the elite. The pressing subject matter of course remains at the forefront, but director Jon Shenk knows that very little has changed since Copenhagen 2009, and he’s not afraid to show it. What was an international crisis and front page material in 2009 is now barely even mentioned. Nasheed’s attempts to save his country are also absent from most news outlets. Nasheed even points out during a radio interview that Manhattan is also only one metre above sea level, and that if things don’t change soon one of the world’s major cities could also become engulfed by the ocean. It’s startling, but in a way you expect Nasheed’s point to go unnoticed. Despite its upbeat and optimistic outlook, the final scene is rather an emotional one. Nasheed looks directly into the camera and says, “We just can’t disappear. We just can’t.” The harsh reality of what’s going on hitting the audience in one final blow. You’ll leave hoping that the world leader’s have heard Nasheed’s cry and will do something. And if in the event, god forbid, that The Maldives does disappear under the Indian Ocean, you’ll hope that Nasheed’s words will echo through time. The final cry for help from a nation before its painful and tragic death. Eric Wood is 21 years old, from Bury in Greater Manchester, and a graduate of Salford University where he studied Journalism and English Literature. His first novel comes out later in the year, and he begins work directing his first feature length movie in the summer. Eric absolutely adores all forms of writing and loves movies so he’s the ideal film critic. His greatest inspiration for many years has been Michael Crichton, as Crichton has written novels, non-fiction, screenplays, and directed movies. Eric would love to be able to achieve all of those things in my lifetime. Tagged climate change, film, Maldives. Bookmark the permalink.